I know there are lots of people living far, far away from family members, and flying solo with children is a regular part of life, but flying solo with Otto did make me feel nervous. No one to hand him to when I needed the toilet, no one to take turns getting him to sleep and no one to stop him from constantly grabbing my food. At 13 months, he’s an an awkward age for flying – no longer breastfeeding (which I find makes everything so much easier) and unable to be entertained by games, films or an iPad for more than a few minutes. He doesn’t have a dummy or a bottle, so I felt like I didn’t really have anything (other than his beloved blanket) if things got desperate. Our outbound flight was a daytime flight and Otto couldn’t really have been better. He fell to sleep beautifully, played, ate and was so happy the whole time. I watched three whole films, and although I didn’t sleep it wasn’t a problem. Our flight home was a night flight and I expected him to sleep most of the way. 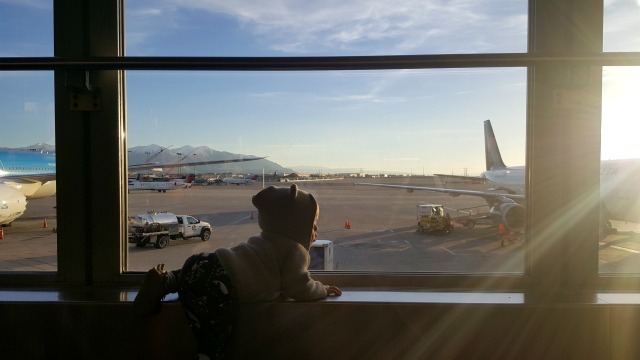 I used to think night flights were more desirable…and have since updated my thoughts – a night flight is a dream if your baby decides to sleep, and if your baby doesn’t – it’s hard, and that’s exactly what happened. I didn’t get one minute of sleep, and he was unsettled, half asleep and grouchy almost the whole time. I practically ran off the aeroplane when we landed, and breathed a huge sigh of relief. Get me out of there! A change of clothes for everyone – This is obvious, but so important. A must if your luggage gets lost, or if your baby wees on you – miraculously bypassing his nappy, vest and onesie. Something that has never happened to me before, but conveniently happened on the aeroplane. I couldn’t believe it! Wear comfortable clothes – This goes without saying. I am always freezing on aeroplanes and immediately take off my shoes and put on a pair of thick socks. Eat a big meal before boarding – This was a tip from a friend, and I’m so glad that they shared it with me. On the way there we filled ourselves with porridge and fruit, and on the way back we ate Mexican before boarding. You won’t get too hungry if your baby is napping, or for some reason it’s difficult to eat for a length of time. 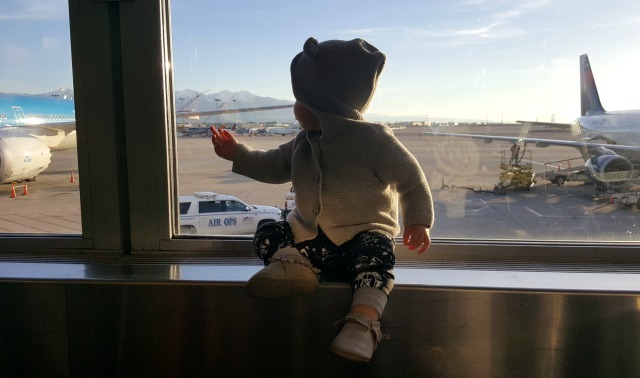 Go to the toilet before boarding – Going to the toilet became a way of breaking up our journey, but it is certainly worth going yourself beforehand, and checking your baby’s nappy. Forego express boarding – I always board at the last second, just so that the boys are free to move for as long as possible. Our seats are assigned, and luggage has been checked in, so I don’t ever feel like this is an inconvenience. Pack light – We’ve taken our boys abroad a number of times, and each time we take less and less. I took a medium suitcase and a rucksack for O and I’s 9 day trip, and still didn’t manage to get through everything. Snacks (not messy ones) and a sippy cup – I took a ridiculous amount of snacks on our outbound flight, and I could not believe that Otto made his way through them all, as well as meals on the plane. He was unstoppable, and I was so relieved that I decided to take so many. Raisins, squeezy fruit pouches, crackers, popcorn and fruit were all stashed in my rucksack. Check the buggy in at the desk and use a baby carrier – I like to have my hands free around airports, so I always check in our buggy and use a carrier. It saves putting it up and down through security, although you may need it if you have a sleepy older child. A four wheeled suitcase – Four wheeled suitcases are brilliant. Smooth, convenient and more manageable. Travel pouch – I travel wallet brings me so much comfort, and it’s never far from my clutches whenever I am at an airport. Favourite book – I brought O’s favourite book with us, and it entertained him longer than I expected. Extra seat – On each flight I was thoughtfully seated next to an empty seat. I don’t know what I would have done without it. On our flights to and from China baby bassinets were available, but this was not the case to and from America. A bassinet would have been better, but an empty seat was incredible, and so appreciated. Stay positive – On our flight back I really had to remind myself that this hour might be frantic, but the next could be fine and I should look forward to that. Make friends – Absolutely everyone was so helpful and friendly on our flights. The cabin crew were really brilliant, and so were the passengers that we sat next to. I recognised some people on our first flight and made sure that I said ‘Hello’, so I felt that I could ask them for help if I needed to. On another flight, a lovely lady in front of me told me that she had a one year old, and that if I needed an assistance I must ask her to help. I concluded that if someone were going to kidnap my child, an aeroplane would not be the ideal place to do it. Little games – Otto loves putting lids on and off bottles, taking things out of a bag and then putting them back in again, or opening and closing boxes, all of which he enjoyed outbound for a decent amount of time. Ask for help if you need it – I am terrible at this, but I am definitely getting better (see ‘make friends’). Oh gosh that second flight must have been tough. 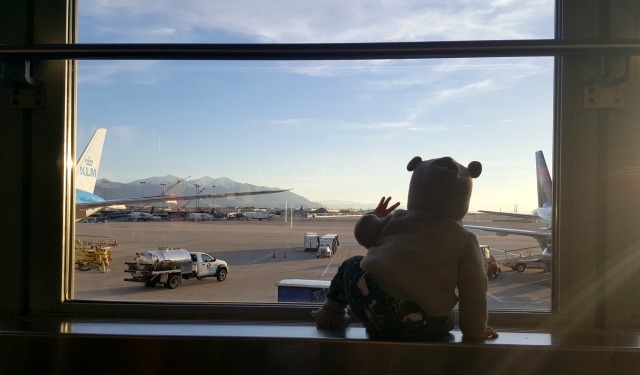 Great tips for anybody flying with little ones. I’ve only taken mine on a very short flight and now I think there will be different concerns as they’re a little older.